Some months ago a purchased an Escam G02 from Banggood for approx. 18€. 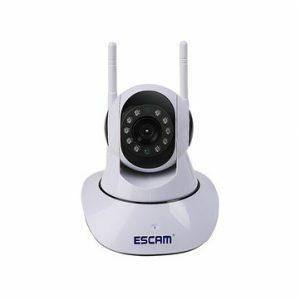 Some days after that Pierre Kim released a paper which showed horrible security flaws in millions of Wifi Webcams, of course after reading this i asked myself if the Escam G02 is also affected. After getting the cam i started digging. Please keep in mind that i am no pro security researcher, but i think i digged deep enought. The Webinterface looks horrible and is „secured“ by the standard admin/admin combo but the rest looks okay. Also it does not feature TLS. Mostly everything is controlled by a cgi script called params.cgi. I was not able to find any problems with that but who knows. Nevertheless the WebIF uses Basic auth but the Password is only base64 encoded, so a MitM could easily retrieve the credentials. If you really want to expose the WebIF to the internet you should change all Passwords (yep there are more that one for the admin) and use the cam behind a SSL Proxy. Now its time to see which ports are open on this device. Open Telnet would be the worst case. But don’t worry haven’t found that. There are 4 ports open: 80 (WebIF), 554 (rtsp), 1935 (rtmp), 8080 Onvif. No more open ports to find. I thought maybe i could gather shell access by finding Serial debug port. There really is one labeled J3 on the PCB. Pin 1 is TX, Pin 2 is Ground, couldnt figure out where RX was. Port uses standard 115200 baud 8N1. Didnt matter what i have tried, i was not able to stop the automatic boot. I have not checked what the app transmits till now, if someone is interested i could do it in the future. Do youreself a favor and disable that feature, maybe also think of disabling DHCP and give the cam a false Gateway address so it cannot phone home. For 18€ the cam is okay and not a complete security mess. Okay i cannot understand why it is not possible to use TLS for Software updates and the Webif but at least there is no open Telnet or vulnarable FTP Scripts. If you only use the cam in your LAN through a VPN and disable the P2P feature you are good to go. If you are more paranoid block the cam from the internet by your firewall. I have purchased a similar cam, from 7Links (pearl.de). The pinout of the debug port seems to be the same, yet I was able to find RX on pin 3. You can log in using the account „default“, with no password. Then you can edit one of the scripts in the /mnt/mtd/ipc folder which is run by the camera binary with root privileges. Use it for example to re-write /etc/shadow to set a new root password (use echo „blabla“ > /etc/shadow) – et voila, the cam is yours. There is even a simpler way to gain access, though: Using the username and password for the web interface open the http:///cgi-bin/ht3510/printscreenrequest.cgi page. Telnet is now enabled for the current session. To permanenly enable telnet you can edit /mnt/mtd/ipc/conf/config_debug.ini and set the parameter to 1. Btw.. if you do not like vi as an editor you can use ftpput and ftpget to upload and download files from/to the camera. That way, you can use your favorite text editor. This will overwrite the /etc/shadow file with the data you provide on the next wifi scan of the camera. Since the findap.sh script is executed with root privileges this works as expected. Just save the file and scan for wifi networks and you should be able to switch to the root account with your favorite password. Any pinout example for serial connection? I guess with only 40 seconds to modify things it will not be possible to get root access – it requires some more editing of files and also re-scanning the wifi. Within that time you will probably not be able to do the necessary modifications. to copy the file to a readable location (you have to remove those lines when copying the shadow file back!). Since you are running a completely different firmware (not the original one) this may just not work at all, though since things might work entirely different. Hope you manage to get the camera working again.. I want to prepare into a notepad txt and after just paste it. Thanks again. @TOBIAS HAGEMEIER can you help me with a full dump, MTD partitions, zImage or mtdblock1? I can not stop kernel execution, so I can not take the root right to modify files. Any ideea about how stop kernel execution? I find this: https://nm-projects.de/2017/01/hacking-ip-camera-digoo-bb-m2-part-3-getting-root-access/ but I do not know how to do it. And bingo, after that you should have root rights. Thank you all for your help, especially @TOBIAS HAGEMEIER. Where sould i connect grnd? I tried to telnet the G02 cam but the user/password of the webserver don’t work. I want to telnet the Cam to discover all the scripts. I have a couple of ESCAM G02 and this post is very useful for me. Thanks Björn and Tobias for this information. Have you any experience with this or have any remote idea of how I can advance? I found your site and i think i brik the camera, trying to put the echo in the run script (maybe some typo) and now the camera won’t boot. Any sugestion to bypass the problem? The reset button don’t do nothing.